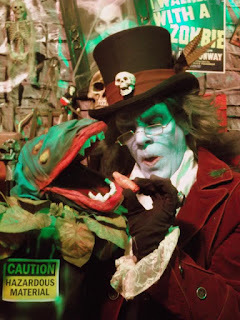 In the fifth episode of Late Night With Uncle Fright, Uncle Fright gets ahead of himself as he presents the movie The Manster. 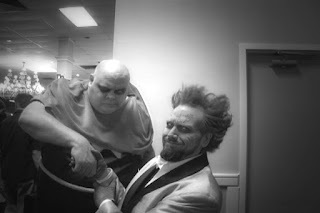 When Mr. Mephisto, from Lennys Inferno, visited Dr. Destruction's Crimson Theatre, Dr. Destruction conducted an interview with his alter ego, Jim Flanigan. 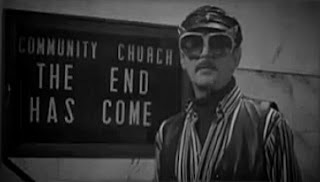 In the third episode of the second season of Nite Owl Theatre, Fritz the Nite Owl presents the movie The Last Man on Earth as well as other retro clips. 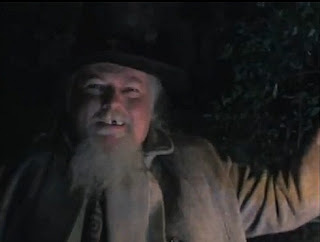 In an episode of Baron Von Ghoulstein's Movie Crypt, Baron Von Ghoulstein presents an idependent horror film called Victor Juliet's Director's Cut. 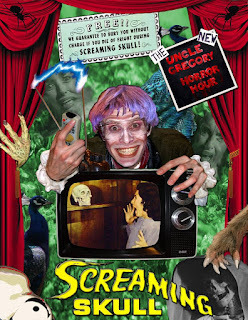 In episode nine of The New Uncle Gregory Horror Hour, Uncle Gregory is excited to show a really scary movie, The Screaming Skull, until Chant reveals some information about the film. 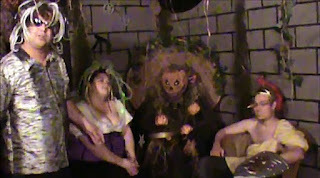 The internet based Phantom Creepers Horror Show began in 2010 and features Phantom Creeper presenting horror movies. Ormsby, from Ormsby's Cinema Insane, interviewed The Geek Girl Burlesque Performers at the Macabre Faire in April 2012. 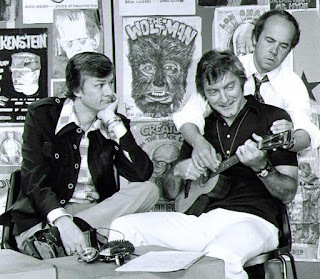 Alan Milair played Dr. E. Nick Witty on the Syracuse, New York show Monster Movie Matinee, from 1964 to 1985. He passed away on April 21, 2012 at the age of 81. 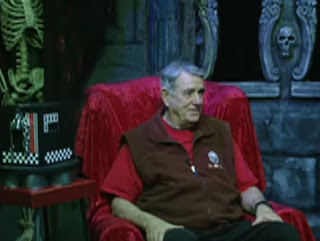 Doc Mock welcomes David Harris to watch the movie The Video Dead in the fifth episode of Doc Mock’s Movie Mausoleum. 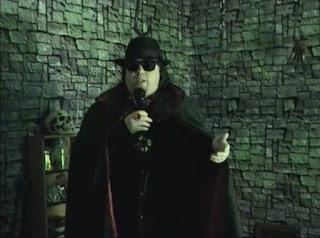 Mr. Mephisto, the host of Lenny's Inferno, returned to the air for the first time in 30 years on an episode of Dr. Destruction's Crimson Theatre on April 20, 2012. The Pumpkin Man is joined by Trojan Dude and other guests to watch the movie Reefer Madness on an episode of Fright Night Theater. In episode 9 of The Angry Brothers Omaha Shock O Rama Jack Angry is joined by Brother James and Ash, who meet Inferna for the first time ans they present the movie Tormented. 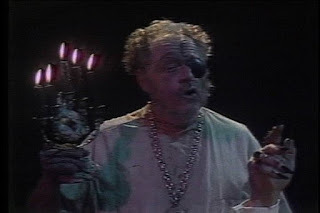 The remainder of the eighth season of Shilling Shockers concludes the time travel storyline with Penny Dreadful, Garou, and Von Bulow traveling back and forth in time and finally finding out people really think of the show. 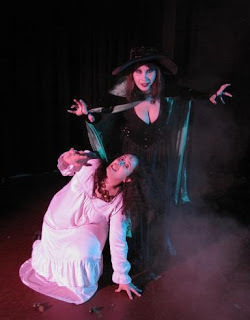 The second episode of Deadly Cinema aired in 2004 and had Jami Deadly presenting the movie Beach Girls and the Monster. 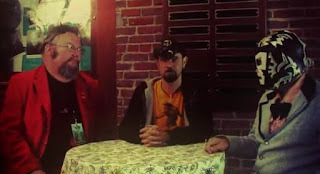 Baron Mondo Von Doren and El Sappo de Tempesto, from Nightmare Theatre visited the 2011 Paracon and interviewed some of the guests. 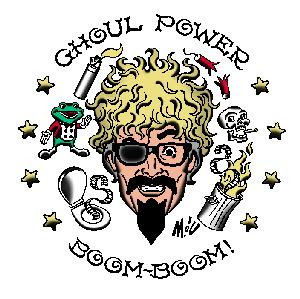 On September 30, 1988 the Cleveland channel WJW-TV8 aired 25 Years of Friday Nights, a look back on all the horror hosts that aired on the channel, including Ghoulardi, Big Chuck, Hoolihan, and, John Rinaldi from Hoolihan and Big Chuck Show and Big Chuck and Lil' John Show. 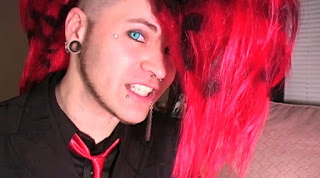 Freakshow and Sin-D Vicious from Bordello of Horror have filmed a promotional video for the Horror Host Graveyard. 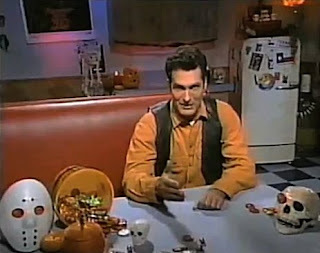 During an all night Halloween Monstervision marathon, Joe Bob Briggs presented the movie Friday the 13th part VI: Jason Lives. 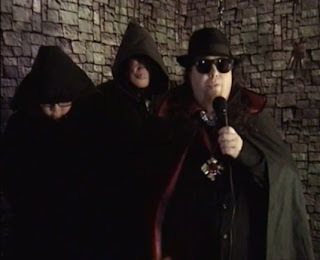 Grim and Grim Junior join Baron Von Ghoulstein for his "Ghoulsurround" version of the movie The Satanic Rites of Dracula in an episode of Baron Von Ghoulstein's Movie Crypt. 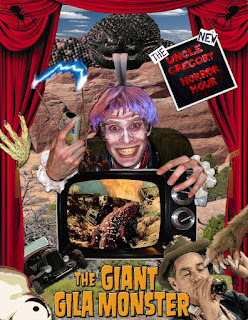 Uncle Gregory wakes up from a long rest after the end of his first season of The New Uncle Gregory Horror Hour to see how things have changed and presents the movie The Giant Gila Monster in episode eight. 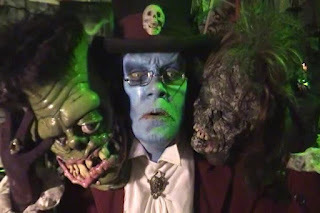 Monster Creature Feature's Ormon Grimsby ran into Creighton, from Ghoul A-Go-Go at the 2011 Monster Bash convention and attempted to interview him. 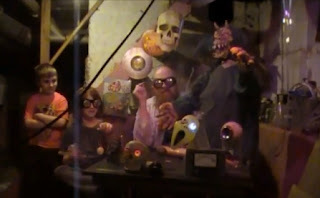 Baron Morbid, Jacques, and Evan celebrate Easter in the forty-third episode of The Basement Of Baron Morbid, in which they present the movie Curse of the Aztec Mummy. 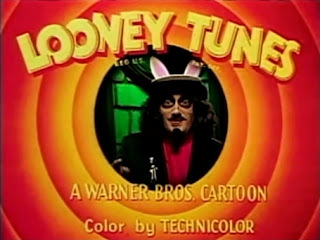 During an episode of Svengoolie, in which he presented the movie Night of the Lepus, he performed a song parody of the theme song to the T.V. show Friends. 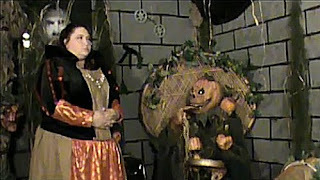 In an episode from the second season of Fright Night Theater, The Pumpkin Man is joined by some new guests as he presents the movie War of the Monsters. 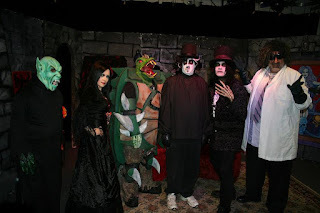 In the season 2 episode 17 edition of Monster Movie Night, Bobby Gammonster is joined by filmmakers Mat and Myron Smith to watch the movie House of Black Death. 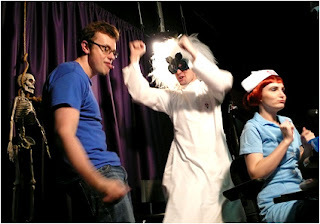 In the third episode of Late Night With Uncle Fright, Uncle Fright presents the movie Inframan. 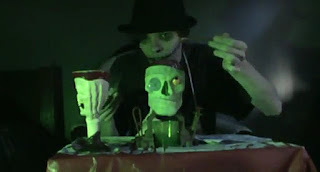 The fourth episode of Fetish Vomitorium Theater, has Kitty Lazereyes, Lizzie Boredom, and Dr. Arnold Feltbody, M.D helping Lucien Eisenach present the movie The Screaming Skull. 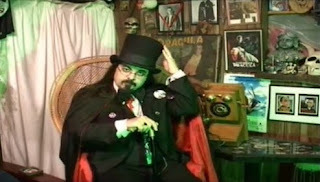 Radioactive Television: "Grave Of The Vampire"
In an episode of Radioactive Television, Tom Ghoulery spends some time in the cemetery while he presents the movie Grave Of The Vampire. 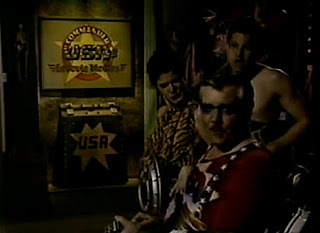 In an episode of Commander USA's Groovie Movies from 1989, Commander USA is joined by Fed and Wilma Fieldstone as he watches the movie Blade Master.